Not only that, stress can stop people performing at their best. Dorset Mind Trustees agree with Mind that open and supportive workplaces benefit everyone – employees, employers and the bottom line. Because of this view, and in conjunction with the work carried out by Mind, Dorset Mind has developed ‘Dorset Mind Works.’ This is a new whole-workplace campaign to support employers and employees with their mental health. First up, Dorset Mind can help organisations undertake a mental health check by carrying out Mind’s Workplace Wellbeing Index. We can help you to find out where you’re doing well and where you could make improvements to employee wellbeing. Firstly – To normalise conversations about emotions and mental health. This will be achieved through an organisation-wide poster, social media and communications campaign. It encourages employees to talk openly, freely and regularly about their mental health. It explains good mental health and describes when normal mental distress can develop into a mental health problem. The campaign will make sure people know when to take action. Secondly – To deliver education programmes. 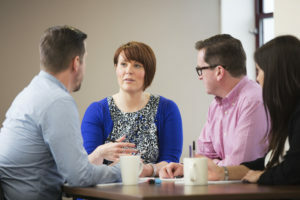 These programmes educate workers, managers and HR departments about good mental health and how to stay mentally healthy. And above all, they educate everyone in the workplace how to spot a mental health problem. If this occurs, the programme will teach them how to start a conversation and seek help if problems arise. Finally – To provide support options designed to address the mental health difficulties of employees. Drop-in group support sessions in the workplace where people can meet and support each other within a guided discussion environment. Dorset Mind will work with your company to calculate a charge for implementing ‘Dorset Mind Works’ depending on your needs. What could be better than a mutually beneficial partnership?